The upside of uncertainty? Unexpected encounter with astonishing beauty. Could I find the essence of Europe’s Camino on the iconic American road trip, or was that simply a foolish proposition? To enter into uncertainty creates the possibility of surprise. Whether that’s perceived as an upside or a downside depends on one’s perspective and if expectations for a particular outcome lurk in the background. To mimic the uncertainty of the Camino de Santiago, I created a rule that I couldn’t plan my lodging more than a few hours in advance. The spiritual challenge arose when, confronted with the choice of lodgings that my mind deemed lousy or expensive, with better options that felt too far to drive given my energy level, my demons harassed me for not planning or thoroughly researching the area. These demons were adamant that one night in either a dreary room or, to avoid that, spending more than I wanted, would permanently blemish my experience or nullify the beauty and expansiveness of being on the road. The chatter in my head, which fixates on what is “wrong” in the moment rather than the big picture (I was traveling! Seeing great stuff!) could quickly create misery even when my physical circumstances were no different than a few hours before. The mind, full of fear, focuses on the downside of uncertainty. To avoid what we might consider a negative outcome, we plan certain things, so at least we think we know what we’re getting into. But what if planning, or too much planning, closes off possibility or limits the upside? And what if the planning creates expectations that might not be fulfilled? The upside of uncertainty? A funky ger, booked at the last minute. 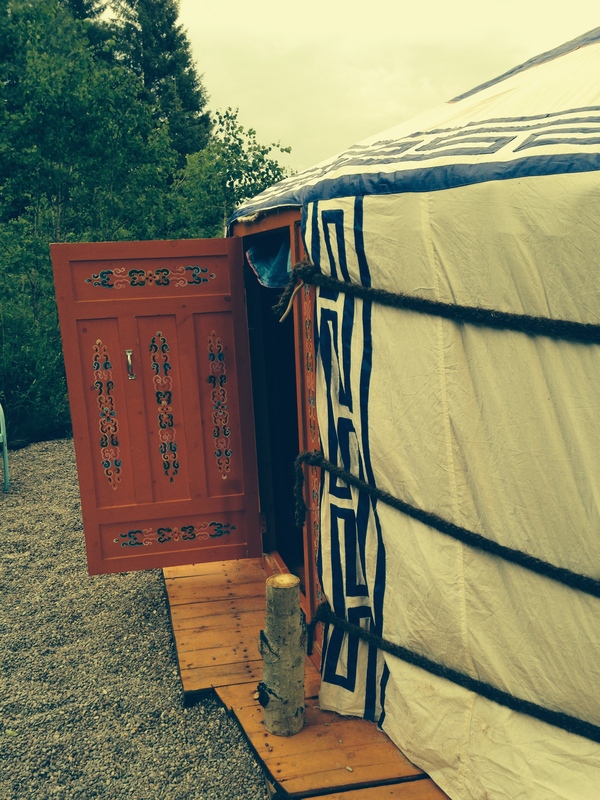 With the exception of visiting popular Glacier National Park, where I booked a Mongolian ger less than 24 hours in advance, my practice of not reserving hotels until the late afternoon worked out. My anxiety around not having a plan diminished day by day as I again learned to embrace self-created uncertainty, entering the trance of movement or a flow state. Following this practice meant detouring into Minden, Nevada for the July 4th weekend rather than being on the California side of Lake Tahoe, where last minute “specials” were hundreds of dollars per evening and many hotels sell out a year in advance. The hotel I found was not one I would have been excited to stay in, an architecturally bland, run of the mill chain. But the cheerful clerk gave me a room larger than the one I paid for, the bed was comfortable, the water hot, and there was space on the floor to lie down and do Feldenkrais exercises. Did I really need anything more? Was I going to allow the absence of charm kill my travel buzz, or could I put the room in the proper perspective? Again and again, I chose the latter. That area, Nevada’s Carson Valley, turned out to be unexpectedly tranquil and beautiful, a geographical mash-up of majestic mountains reminiscent of Colorado’s and plains and hills covered in pale green sage brush echoing those of New Mexico. On the 4th, I explored Virginia City, a funky old mining town perched on a hillside, festooned in red, white and blue bunting, teeming with visitors and food vendors amidst period buildings, some gleamingly restored, others crookedly clinging for life. Neither place was on a bucket list, yet stumbling across them allowed me to create my own fresh impressions of this part of the country, rather than relying on hearsay or the one time, years ago, I visited Las Vegas. In Spain, crossing from Basque Country to Navarra, onwards to Castillo y Leon, and eventually Galicia, I was struck equally by the differences and similarities of these regions, linked together by an ancient path. Moving slowly and without preconceived notions helped me see what was there, rather than trying to fit what I was observing into someone’s else narrative. And while it’s useful and fun to notice distinctions, sometimes it’s more challenging to find similarities, what binds people and regions together rather than what sets them apart. In a turbulent and fear-filled world, could I do my minuscule part by seeking out common denominators? To be in the landscape in the area called Nevada and see it unfold as part of the continuum of this continent, rather than thinking of it as a distinct entity, allowed me to appreciate this area more than my mind, quick to reject it for its conservatism and gun culture, would have deemed possible. Having traversed traditional communities in Spain, hearing the pop-pop-pop of hunters at times, couldn’t I do the same here in the service of forging a singular me? Shortly thereafter, traveling through the place called Oregon, en route to Seattle to visit friends (who received more than 24 hours notice), I slept one night at the comically named Majestic Hotel in Klamath Falls. 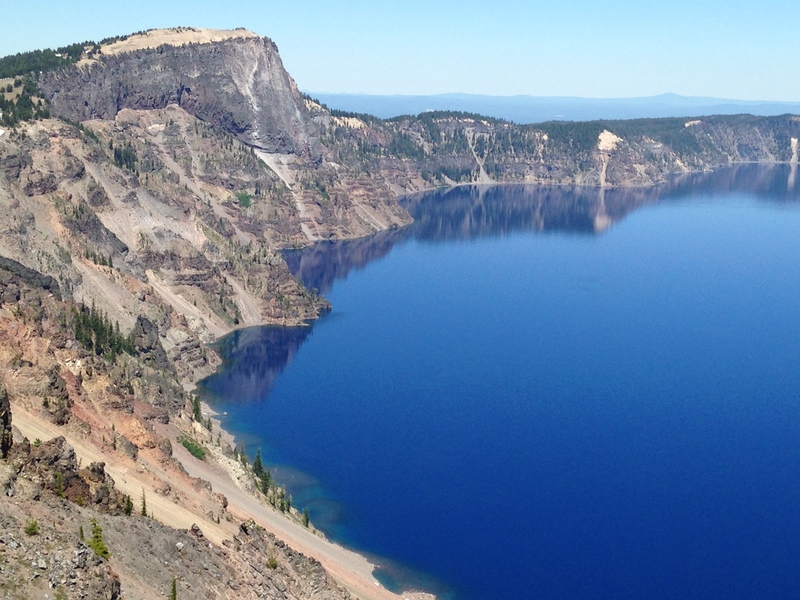 The friendly manager casually mentioned Crater Lake National Park, not on my radar. It seemed worth a short detour and an opportunity to use my new National Parks pass. Mesmerized by the blue depths of the lake, formed by an imploding volcano, I could barely tear myself away. While circumnavigating the lake hours later, snapping photos every few feet to document my infatuation, I received an e-mail from a reader whom I’d met once. He invited me to stay with him and his partner if I were in the Portland area, unaware I was a few hours away. Gleeful at the serendipity, I called and asked if I could arrive that same evening. He said yes. Since I hadn’t reserved a room, I was free to accept his spontaneous and generous offer. While driving to his house, the wind grabbed a piece of molding from around my windshield. Knowing I had a place to spend an extra night in case the repair took time was a relief. Had I heeded my fears and stuck to an itinerary or plan, I wouldn’t have been able to enjoy landing in a comfortable bed, savoring a home cooked meal, conversation, the company of two adorable cats, a dip in Lake Oswego, guided sightseeing and dinner at a Vietnamese restaurant. That this opportunity had materialized through my writing was beyond thrilling, as if the words I’d been sending out into the ether had woven themselves into a net that would cradle me exactly when I needed it. Following your journey and the insights you are sharing is great. Thank you!